It’s been said many times that the war is a self-sustaining industry that requires a constant threat overseas to keep the machine thriving at home. Looking at the millions if not billions of dollars spent on securing “national special security events” against its own citizens, it’s clear that protesters have become the threat that has allowed, in part, the warfare state to flourish on American soil. Sound dramatic? One need only to look at the lockdown of our cities during these “events” — whether it be the NATO Summit in Chicago today, or preparations to militarize the cities of Tampa and Charlotte for the Democratic and Republican conventions this summer — to see that the constitutionally protected, American tradition of protest has become a reason for law enforcement to spend their quickly evaporating budgets each year on new toys and overtime — including the latest in surveillance, crowd control gear and communications equipment, not to mention the helicopters overhead and armed vehicles on the ground. , all in the order of counterterrorism and national security. No one would dispute that the gathering of representatives from 50 member states of the North Atlantic Treaty Organization (NATO), including 28 members of the military alliance in Afghanistan, warrants extra security. Indeed, we live in a world today where gunmen walk right up to U.S. members of Congress and shoot them in the head, or pack cars full of explosives on the city street. But it becomes increasingly clear, after 10 years of conventions and “special events” with little or no incident, that the specter of terrorism is being used to generate intimidating and repressive conditions, particularly against peaceful protesters, and proliferating an industry that thrives on domestic conflict and chaos. According to this report, funding for the U.S. homeland security and homeland defense sector (including federal, state and local governments, and the private sector) will grow from $184 billion in 2011 to $205 billion by 2014. The market will grow from $73 billion in 2011 to $86 billion by 2014. “The face of terrorism is constantly changing,” insisted GovSec Director Don Berey in a GovSec press release. “As a result, it is critical that those on the front lines of homeland security understand where new threats may arise and how their strategies must be adjusted to remain ever vigilant.” Adjusted, and paid for.
. They’re shutting the trains. They’re closing exits off the freeways. And they’re creating a kind of culture of fear. We have police officers we—who are friends of ours, we run into in coffee shops. They’ve told us that the training is focused a lot on the danger of the protesters and how you should be careful when you grab one of them, because they might have some kind of poison spike in their sleeve or something. I mean, it really is quite nuts. At the same time, they’ve denied permits, taken permits away, given them back, been very vague about making any agreement with the protesters…we insist that this is a family-friendly, nonviolent, permitted march. And all the kind of hysteria about what’s about to happen is really brought on by the police. I don’t think anything is going to happen, except that they are creating the conditions for a police riot, once again." Reports on Monday morning indicated that 45 people were arrested and four officers injured, including a police officer who was reportedly stabbed during a dramatic clash with protesters on Sunday night. In his remarks to reporters Sunday, Chicago Police Chief Garry McCarthy blamed the “black bloc” for rushing the police and precipitating the violence. In each of these instances, the police did not inform those detained why they were being detained." And who knows how much these dynamics fueled the anxiety and hostility in the air between police and protesters before exploding late Sunday afternoon? They don’t call it a tinderbox for nothing. A massive crowd of activists was significantly outnumbered on Sunday by armed police, many in riot gear. They lined the march route. They swarmed off buses. They looked a little ridiculous as we marched nonviolently, just as we’d intended to do. The marching didn’t harm anyone or destroy any accumulated riches or smash any of the windows that were not boarded up. Police did not allow the day to end without any use of their training and weapons. Not long after I left, according to numerous reports, all hell broke loose. If it hadn’t, think of how many of those people fearfully watching Sunday’s march from their high balconies would have joined in the next one and invited their friends!" The militarization aspect is uncanny and has been captured in numerous photos now circulating in places like Twitter. All we need to know is on Thursday, Chief McCarthy took to the airways to talk about his 12,000 officers doing “12-hour tours” instead of 12-hour shifts, as though policing parades and protests and keeping vigilant outside of this international gathering was indeed, going to war. This is not surprising, given how much law enforcement now emulates the military and the military feeds on this, handing down a record $500 million in surplus equipment to local departments in 2011 alone. 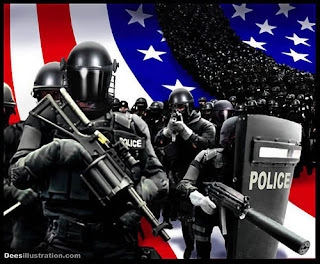 This is a decade-old phenomenon, in which “the military surplus program and (police) paramilitary units feed off one another in a cyclical loop that has caused an explosive growth in militarized crime control techniques.” Federal grants help the process along, leading “to a booming law enforcement industry that specifically markets military-style weaponry to local police departments,” wrote Rania Khalek in an explosive 2011 report for Alternet, which begins with the story of a 7-year-old girl who was shot in the neck by police during a SWAT raid in Detroit. Today, Mayberrys all across the country have tanks and M-16s, and according to one estimate, SWAT teams outfitted for convoy on Route Michigan to Ramadi are conducting some 40,000 raids a year across America. Sadly, though SWAT teams were once only used in emergency situations like a hostage crises, these paramilitary units are more inclined to use their fancy new gear to perform normal police work, like executing warrants, often resulting in botched raids and the death of innocent citizens. An interesting map of botched SWAT raids by Cato’s Radley Balko is here. This year’s Occupy protests have been instructive in many ways, not the least of which they have shown how police are employing their military stockpiles and all the latest crowd control devices and strategy, the result of this massive niche market that has exploded after 9/11. This industry not only hawks the latest in hardware (pepper spray, Tasers, flash grenades, smoke bombs, rubber bullets, cameras, GPS), but traffics in training and consultants that cost municipalities big bucks for the privilege. “Why is it that the state is spending so much money on arming the police here supposedly in response to what is being planned as a peaceful protest?” said John Beecham, an anti-war protest organizer, in an interview about Chicago with The Guardian. Turns out Chicago raised upwards of $55 million, including $19 million in federal security grants, for security, traffic control and sanitation for the summit. We know that at least $1 million was used to buy new riot gear, and $40,000 for two new Long Range Acoustic Devices (LRAD). Officials say they are using this “modern megaphone” as a “messaging device,” and not to produce “high pitched alarm tones,” that have been blamed for damaging the protesters’ hearing when the LRAD was used at the Pittsburgh G8 summit in 2011. We also note that some of the biggest corporate donors to Chicago’s summit fund are Honeywell, Boeing Corp & Raytheon, all huge players in the nation’s defense contracting industry. Meanwhile, Tampa and Charlotte will each receive $50 million in federal taxpayer funding to secure their cities in anticipation of the zombie apocalypse RNC and DNC confabs respectively. That is in addition to whatever else the state and city fathers plan to contribute for the occasion. "The (Tampa) city council agreed to spend nearly $237,000 on a Lenco BearCat armored vehicle, which will be used in conjunction with two aging armored vehicles the city acquired through the military surplus program. Tampa Assistant Police Chief Marc Hamlin told the Tampa Bay Times that the trucks are strictly for the purpose of protecting officers from potential gunfire, not for day-to-day patrolling and crowd control." Whatever would be they doing in an armored vehicle during the convention if not engaging in some variation of “crowd control”? Are they truly expecting an insurgent attack in sunny downtown Tampa? It may feel as hot in August, but it is most certainly not Baghdad. "Another $1.18 million is going toward new digital video communication technology that will allow police helicopters to transmit video to cops on the ground equipped with handheld receivers. Various news outlets report that an additional $2 million was requested to ramp up surveillance with the installation of 60 surveillance cameras in downtown Tampa, far more than the five traffic cameras the city currently has." Meanwhile, according to Ray Reyes of The Tampa Tribune, the city has purchased $815,000 in riot gear, and $6 million for new two-way walkie-talkies. The $13.5 million already spent also includes four-wheel drive utility vehicles, and 200 bikes for patrol officers. The city is also expected to pay $25 million to train, house and feed 3,000 visiting police officers for the event. Despite the hype, there has been no major terror threat associated with the national conventions since 9/11. Given this, it is safe to assume that not only is the massive security presence an extravagant vanity exercise for the quadrennial gathering of politicians, lobbyists and party delegates, but yet another way to justify the enormous annual budgets of the burgeoning homeland enterprise. And as someone who has been to the last two rounds of conventions, I can say the display has gotten more intense each time. Meanwhile, instead of shrinking from it, the protest movement seems to be growing in proportion to the hyper-militarization nationwide. The gulf between “civilian” and “soldier” on the street widens, too. Bursts of violent skirmishes appear inevitable now, a self-fulfilling prophecy unfolding before our eyes. While this may be quite profitable for War Inc., the impact on the health of our society, much less the republic, may be incalculable.